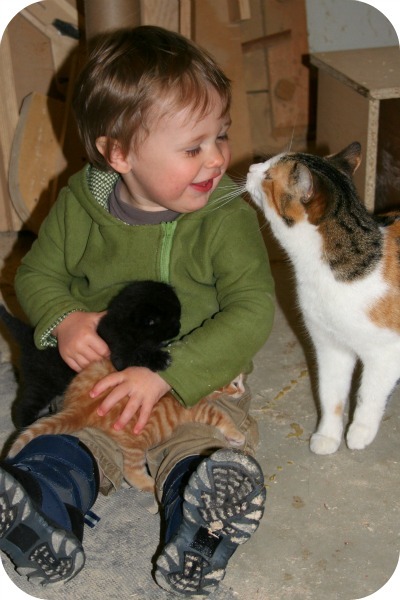 I thought I'd post an outrageously adorable photo of the R-man and some kittens while I wait for my iron to heat up. Did you know they are the official alternative Easter animal when bunnies, chicks and lambs are unavailable? That might be a lie. At four weeks old, they're pretty darn precious. Rowan has his keester parked on the floor of my dad's workshop and is getting an 'are-you-a-kitten-slayer' inspection from Mama Cat. He passed. And yes, he's also wearing a new Urban Hoodie. Considering the pattern goes up to size 5T, you'll be seeing a lot of them! This weekend's goal is to not go into a chocolate induced comma. Success is unlikely.